Posted January 24, 2019 by Josette Farrell in News. AGRONOMIST RICHARD HACKETT wrote a much-commented-upon opinion piece in the Irish Independent before Christmas about the level of food imports coming into this country. The data on which he based his article came from the CSO. It got more attention than usual because of Brexit as we turn our thoughts to what that particular train wreck might mean for our food security. We are, after all, an island nation, and therefore highly dependent on another island nation to our east as a stepping stone to and from continental Europe. What is alarming about the figures is what they tell us about the profile of our imports. 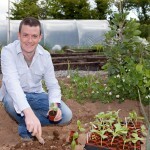 It’s no longer just about ‘exotic’ fruit and veg that we can’t grow well commercially in Ireland. 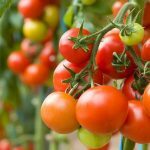 We are now hugely reliant on imports of food that we can grow perfectly well here. In 2017, for example, we imported 7kg of carrots, 10kg onions and 13kg of apples for every person in the country. We also imported staggering quantities of vegetables that were once considered our national vegetables – 72,000 tonnes of potatoes and 23,000 tonnes of cabbage in one year. A borderless EU has made it almost impossible for Irish growers to compete with specialist growers on the continent, mainly in Spain and Holland. As Hackett points out, this is because labour costs (which are the highest component of overall costs) are cheaper there. What his article misses perhaps is the role that supermarkets and consumers – yes, we have to take responsibility too – have played in driving down the cost of vegetables to unsustainable levels. In the Christmas just passed, we once again saw supermarkets doing aggressive (39 cent per kilo!) price promotions on the Christmas dinner staple veg to entice you in. Year on year, these price promotions and our decision to take advantage of them, are putting indigenous vegetable growers out of business. If the government is serious about our food security as a nation, it should protect growers from these below-cost sales promotions. In the process, they would also be protecting Irish jobs, reducing our transport carbon emissions and ensuring we have access to more truly fresh, seasonal, local food. Of course, you won’t be surprised to hear that I think growing some food yourself is part of the solution. I’m not naïve enough to think that home-grown food will replace the commercial horticulture industry. Very few of us are ever likely to grow all of our own food or get even close. But when we grow some food ourselves, we learn about how food grows. We learn about seasonality and taste and freshness. Above all, we learn to value veg and the people that grow them. Ultimately that makes us more informed consumers when we go to buy the veg we haven’t grown ourselves. Lured by the fine weather last weekend, I emerged from my self-imposed winter hibernation and got some work done in the garden. I can’t help feeling a little worried by how strangely nature is behaving at the moment. I read this week that butterflies, which don’t generally survive the winter have been spotted in Dublin. In my own garden, the grass is growing – I refuse to mow grass in January. And as a result, our hens’ eggs have turned the kind of vibrant yellow they normally turn later in the spring when they access new season grass. In the veg patch, I’ve noticed potato plants growing from un-harvested tubers from last year, it would typically be far too cold for spuds to grow until March or April. There’s always the risk of course that a cold snap will come along (remember the snow last March) and give us a proper winter. How will nature react then? The brother-in-law came to visit last weekend and is always game for some garden work. 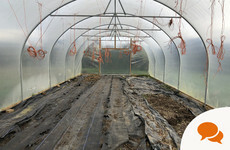 So, leaving my climate change angst behind me in the house, we got out and cleared up the two polytunnels. In the big tunnel, we cleared the tomato plants – a job that should have been done in November really. We broke up the plants and put them on the compost heap. Though I was tempted to take up the mypex cover from the soil to allow it to breathe a bit, I decided to leave it there on the basis that it will keep weeds at bay. I will have to lift it anyway to put a covering of compost and other nutrients, seaweed and poultry manure pellets, but I think that can wait until later in the spring. This year’s tomato plants won’t be planted out until May or so. 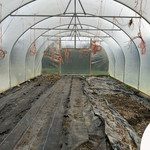 The smaller polytunnel is dedicated to leaves and has been more or less full all winter with kale, chard, perpetual spinach and oriental greens. I also have some herbs growing in there – a giant, somewhat straggly lemon verbena plant, lots of parsley and thyme. Not being a fan of eating salad in the winter, I haven’t bothered much with the oriental leaves to be honest, but we’ve been harvesting the kale, chard and spinach semi-regularly. I like some wilted chard or spinach under my poached egg in the morning, thank you very much. Thanks to the fine weather, the chard, in particular, is thriving. We did a good clean up in the tunnel, clearing out the weeds from in between plants and in the paths, and any bolted salads. After a lazy December, it felt like re-claiming the veg patch again. Heat the oven to 170c. Rub a gratin dish with the butter. Peel the potatoes and slice them thinly, either with a sharp knife or a mandolin. Cut the outer layer off the celeriac and slice this thinly, too. Peel, quarter and core the pears, and slice each quarter thinly lengthwise. Combine the vegetables and pear in a bowl, season and toss. Arrange the mixture in the gratin dish, pressing it as flat as possible so there are not too many gaps and air pockets. Put the cream and milk in a saucepan with the garlic halves, the bay leaf, the nutmeg and plenty of salt and pepper, and heat until just below boiling. Pour over the veg in the dish (take the bay leaf out at this stage, but keep the garlic in). Bake for 1.5 hours. The gratin is ready when the top is golden and bubbling, and a small, sharp knife easily pierces the vegetables all the way through. You may want to turn up the heat to 190-200C (gas mark 5 or 6) for five minutes at the end for a bit of extra bubbling crispness. Leave to rest and cool for five minutes or so before serving.